Dazzled by all the shimmer, they fall in with a glamorous alleycat who offers to be their tour guide. Mouse is insatiable. ‘More light! More light!’ he squeaks. Which is how he winds up at The Glitz, a restaurant atop a skyscraper with a large sign on the door showing that not all are welcome. ‘No Bears’ is its strict admission policy. Being a good-natured sweetheart, Bear doesn’t mind, though he does remind House as he heads on in with Cat, ‘Remember – just call, and I’ll come’. It’s not long before Mouse is shouting Bear’s name across the rooftops with increasing panic. Ex-publisher Teresa Heapy’s zesty adventure glints with luminous language, and its finale – featuring a paper aeroplane and some poetic stargazing – is very charming. But it’s David Litchfield’s illustrations that bring it to life: characterful, colourful, and with just the right combination of appeal and menace. The Spectacular City is a touching cautionary tale of friendship but it’s also about knowing the value of what you already have, and – perhaps more tellingly – about mistrusting those bright lights and returning to a simpler, rural way of life. 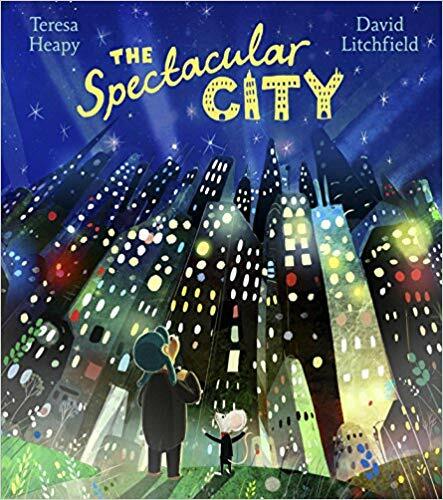 The Spectacular City by Teresa Heapy and David Litchfield is published by Red Fox at £6.99.